3) The effect of a big win on a thoroughbred racehorse. I won’t address the first couple of items — I too continue to be baffled — but I will weigh in on the third point. 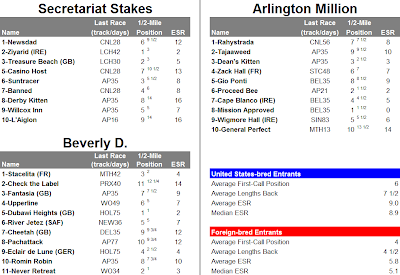 Awhile back, I published a study I had done on “daylight winners,” which I defined as horses that had won their last start by three lengths or more. Although these dominant winners returned a net loss in their following starts, it’s worth noting that Dr. Quirin didn’t insist on any other positive form factors outside of the daylight win. But do these impressive numbers still hold true today? After all, Mr. Quirin’s studies took place nearly 30 years ago — back when Beyer figures could only be found scrawled on the Daily Racing Form of the man himself. Interesting. It appears that as the purse of the race gets higher, the impact of a big win becomes less pronounced — or, maybe more accurately, the public overplays that particular factor in richer races (note the average winning mutuel). * Play is restricted to horses that won their last race by three lengths or more over today’s general track surface (main/turf) within the past 30 days. * Today’s purse must be less than $25,000. * Horse must be going to post at odds equal to or greater than its morning line price. Granted, the winning rate is akin to that of my beloved Seattle Mariners this season (OK, I’m exaggerating a little), but the return on investment (ROI) is a healthy 17 percent. That’s not the kind of return that would make me want to mortgage the house for betting capital, but it’s not bad for such a straightforward angle. 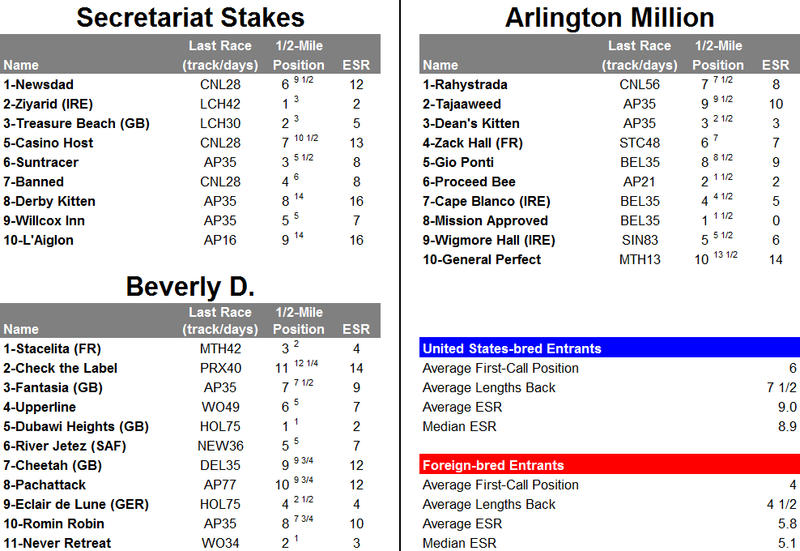 I keep hearing that U.S. breeders are breeding for speed, yet how does one explain Arlington Million Day (Aug. 13)? In the three Grade I turf races that afternoon — the Secretariat, the Beverly D. and the Million — two of the 11 foreign-bred horses competing led after the opening half-mile, compared to just one of the 19 American horses. What's more seven (63.6 percent) of the foreigners were positioned in the top half of the field at the first call versus just six (31.6 percent) of the U.S.-born runners. It gets worse. The average early speed ration (ESR) of the foreign-bred steeds was a +6; the Americans averaged a +9. If this breeding for “speed” continues, I foresee tracks going back to a tape barrier. For further race analysis and suggested plays, be sure to listen to this week’s “TwinSpires Horse Racing Podcast with Derek Simon” on Friday (live at 1 p.m. Eastern on BlogTalk Radio or archived on iTunes and other podcast directories shortly thereafter).